JUST PUBLISHED IN PRINT AND AUDIO! Reproduction of any of the contents of this page, or of anything on this website, including photographs, without permission is prohibited. My next books are in the works! In October, Houghton Mifflin Harcourt will publish my next book, How to Tell Fate from Destiny and Other Skillful Word Distinctions, which covers difficult verbal distinctions such as "forgo, forego"; "prone, supine"; "precipitous, precipitate"; "venal, venial"; "till, until, ’til"; "legerdemain, prestidigitation, thaumaturgy"; and, of course, "fate, destiny, fortune, kismet, karma." A concurrent audio edition, narrated by me, will be published by HighBridge, an imprint of Recorded Books. The Enthusiasms of Charles Harrington Elster will be a collection of my writings on language, literature, and life over the past 30 years. It will include essays, speeches, reviews, radio commentary, letters, and prose poetry and verse — in short, a portrait of the language maven ab ovo usque ad mala (Latin, "from the eggs to the apples"; colloquially, "from soup to nuts"). Enthusiasms will be published in two volumes, both as an ebook and as a print-on-demand book. The first volume will focus on literature and life; the second will focus on language. And I'm thrilled to report that the multitalented San Diego graphic artist and painter Julie Warren has designed my book covers, which feature her original artwork. There's a link to her website (www.juliewarren.net) under Quick Links in the sidebar on the right. Now that I've finished the book for HMH I will return to editing volume one, with the hope that I can publish it by the summer of 2018. I will provide an update here when publication is imminent. Charlie's previous book is a crash course in careful usage. Click here to order it now. Antac Pest Control left a tag on my door the other day that asked, "Unwanted Pests Bugging You?" I want to ask Antac, are there any pests that I might want? When I was a kid we would amuse ourselves by telling one-line jokes that were bad puns posing as book titles. "Over the Cliff" by Hugo First, we'd say, and titter uncontrollably. Or "Yellow River" by I. P. Daily. You get the drift. Now comes a real book in the same vein, whose title recalls those old, puerile jokes: Gee Whiz: It's All About Pee by Susan Goodman. When Benedict resigned his papacy in early 2013, citing fatigue as the reason for his decision, a friend of mine remarked that he apparently was "too pooped to pope." And I figured that if the pope was pooped, it must have been all the pontificating that wiped him out. Functional shift is often unfairly criticized by defenders of the language who fail to realize that finding new and useful ways to use the verbal tools we already have is perhaps the main reason English is so versatile, expressive, and healthy. Seen on a retail website: "Any illegal use is prohibited by law." That one has to win the Say-It-Again-Sam Award for Pleonastic Redundancy. Seen on a menu at a Japanese restaurant in San Diego: "Pork Catlets." Thankfully, hot dogs were not on the menu. From a promotional card at a winery: "We are proud to present 1998 Georges Duboeuf Beaujolais Nouveau: aromatic, supple, fruity, rounded and unctuous." I can accept a wine's being charactized figuratively as "supple" and "rounded," but "unctuous"? Whoever wrote that description clearly did not grasp the negative implications of the word. As I note in Verbal Advantage, unctuous comes from the Latin ungere, to anoint, besmear, which is also the source of the English word unguent (UHNG-gwent), a medicinal ointment, salve (SAV or SAHV). By derivation unctuous means "oily, fatty, having a greasy or soapy feel," and today unctuous is used to mean "having a slimy, slippery, or smarmy manner." The unctuous person appears agreeable or earnest, but in an affected, self-serving, and insincere way. Seen on a chalkboard outside a restaurant in San Diego: "Today’s special: angel hair capellini." I was tempted to order that redundant dish along with some penne pasta (penne is a kind of pasta), shrimp scampi ("scampi" is Italian for "shrimp"), and soup du jour of the day ("du jour" means "of the day"). Why do the directions on vitamin bottles and prescription drug labels always say something like "Take one pill three times a day"? It's possible that a cow could take the same pill three times a day, but how is a human being supposed to do that? Sign on a freeway off-ramp in San Diego: "Road Closed Intermittenly." Does that mean the road will be blocked off with a pile of mittens? Urgent message on the envelope of a piece of junk mail from Western Lending Corp.: "Do Not Fold: Contains Your FREE Mercedes!" Now that's what you might call "pushing the envelope." From an ad on my email homepage: "Destroy yellow teeth!" I think I'll keep them for now, if you don't mind. On a coupon for a San Diego restaurant: "Pre Fixed Menu." Even with the requisite hyphen (pre-fixed) this would be a gaffe. It's not the menu that's fixed beforehand; it's the price. The proper spelling is prix fixe (PREE FIKS), which comes to us from French. Postscript to an email message I once received: "I hope I didn't make to [too] many grammitical [grammatical] errors in this email." Funny thing was, the writer hadn't made any errors until tacking on this disastrous sentence. Note: Because of a change mandated by my website manager (the Authors Guild), as of July 2018 visitors to this page will no longer be able to post questions and comments. My apologies for that. But you may still leave a post on my BLOG page (menu bar above) or contact me by email either through the CONTACT page on the menu bar or by clicking on WRITE TO CHARLIE (under QUICK LINKS in the sidebar on the right). I reserve the right to post your emailed questions, with my answers, on this page. I will publish only your first name unless you instruct me otherwise, and I will not publish your email address. On the Mandy Connell Show on KOA Denver 850 AM today (April 18, 2019), a caller asked about the origin of the saying "No man's life, liberty, or property are safe while the legislature is in session." Was it a quip from Mark Twain or someone else? he wondered. I responded that lots of quotes get attributed to Twain that he never said, such as "Whenever I feel the urge to exercise, I lie down until it goes away." A little bit of internet research (well beyond Wikipedia) revealed that the quote apparently belongs to one Gideon J. Tucker (1826-1899), a lawyer, newspaper editor, and politician who wrote it in an 1866 court decision. My sources for this conclusion include Fred R. Shapiro, a librarian at the Yale School of Law and the author of The Yale Book of Quotations (http://listserv.linguistlist.org/pipermail/ads-l/2006-August/061772.html), and Respectfully Quoted: A Dictionary of Quotations (1989). Another caller on that show asked whether so-called words like "hmm" and "uh-huh" were in fact words. Do they have meanings or were they just sounds we interpret from context? The answer is yes, they are indeed words, and they are classified either as interjections or filler words (also known as speech disfluencies). The second unabridged edition of the Random House Dictionary defines an interjection as "any member of a class of words expressing emotion, distinguished in most languages by their use in grammatical isolation, as Hey! Oh! Ouch! Ugh!" To that I would add Indeed, Amen, Huh? and the transcendent Yinglish Oy! Interjections also include stand-alone phrases such as Good grief, You bet, and the charming and indispensable fuhgeddaboudit! from NewYorkese. Random House also lists uh-huh (meaning "yes") and uh-uh (meaning "no") as interjections, to which I would add uh-oh (meaning "whatever just happened or is about to happen is not auspicious"). Filler words, or speech disfluencies, are slightly different and comprise all the sounds we make when we pause in speech, such as hmm (meaning "I'm contemplating this"), um, er, uh, eh, and ah. On the Mandy Connell Show on KOA Denver 850 AM (February 21, 2019), a caller asked about the origin of the expression "piece of cake," meaning "something easy or pleasant." Not knowing the answer off the top of my head, and not having my favorite phrase origin references handy, I promised to post an answer here after the show. In their Dictionary of Word and Phrase Origins (second edition, 1977), William and Mary Morris explain that the Oxford English Dictionary shows "it first appeared in print in a work by American poet Ogden Nash, who wrote in 1936: 'Her picture's in the papers now, and life's a piece of cake.' But, if it first turned up in America, it was swiftly adopted by British airmen in World War II. In 1943 the author of Spitfires over Malta wrote: 'The mass raids promised to be a piece of cake and we expected to take a heavy toll.' Certainly piece of cake was originally more popular in Britain than in the United States." To that I would add, probably not anymore. Although all three of the OED's citations for the expression are British, the evidence of my ears and eyes says it has been popular in American English since at least the 1960s. As to why it means "something easy and pleasant," you only have to consider all the nice things that eating a piece of cake connotes. Incidentally, a related expression in American English is "easy as pie." On the Mandy Connell Show on KOA Denver 850 AM today (January 17, 2019), a caller asked why we say "New Year's Day" instead of "New Year Day." We don't say Labor's Day or Independence's Day, so why the apostrophe in New Year's? Well, to begin with, although New Year Day is documented, New Year's Day has been used since the 14th century and is the preferred form. We also traditionally prefer New Year's Eve over New Year Eve. I'm surmising here, but I think it may have been an ancient custom to show possession of the day by the thing or person named: thus, St. Patrick's Day and Valentine's Day (and many other saints' days); April Fool's or April Fools' Day; and All Hallow's Eve (our modern Halloween). Modern style tends to drop the possessives, so you often see Mothers Day instead of Mother's Day or Mothers' Day and Presidents Day instead of Presidents' Day. But the old habits abide, so we still refer to the first day of January as belonging to the new year. On the Mandy Connell Show on KOA Denver 850 AM today (November 15, 2018), a caller stumped me by asking why the Philippines was spelled with /ph/ while its residents are Filipinos, with an /f/. I was able to find the answer and broadcast it after the half-hour break, but for anyone who missed that, here's the deal . . . The islands are known as the Philippines because they were named, in the 1500s, after Philip II of Spain, "in whose reign they were claimed as a Spanish colony," says the Oxford English Dictionary. But it was the phonetic Spanish spelling for the islands, "Islas Filipinas," also established in the 1500s, that stuck for the native islanders. Incidentally, if you're wondering about "Pilipino," that word comes from Tagalog and means either "the national language of the Phillipines, based on Tagalog," or "of or relating to the language Pilipino" (OED). On Jefferson Public Radio this morning (November 6, 2018), with host Geoffrey Riley, a caller asked about the pronunciation of the word "skeletal," saying she had heard someone from Australia put the accent on the second syllable: skuh-LEE-tul (instead of the usual SKEL-uh-tul). I said I'd never heard that variant and that once I had researched it I would post an answer here. It turns out that second-syllable stress is a British innovation of the very late 20th century, which explains why an Aussie might adopt it. You can hear it as a secondary British pronunciation in the online Oxford English Dictionary, and it's listed as an alternative in the OED's 1989 second edition and in the 2001 Oxford Dictionary of Pronunciation. But it doesn't appear in the first OED edition (1928) or in ANY of my American sources, including medical dictionaries. Conclusion: This is a sham-refined British variant that American speakers should superciliously eschew (please make that es-CHOO, not e-SHOO). Constance Hale is one of the best writing mentors in the business. Her style is smart, accessible, and fun, and her advice is always spot-on. (Full disclosure: Connie is a longtime colleague, but I'd still be saying this if I didn't know her.) In this book, based on her previous book SIN AND SYNTAX and her extensive experience leading writing workshops, Connie offers English teachers valuable tools and methods to ignite the spark of literary creativity in their students and help them burnish the results. 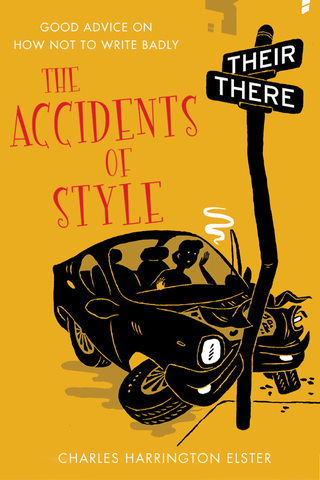 My college-age daughter is prepping for a student tutoring position at her university in the fall by studying [Mr. Elster's] book The Accidents of Style. She is enjoying the book and is fixing some problematic word usage habits in her own vocabulary and writing. She said she feels like this fills in some of the Phonics holes in her education that she missed due to surgeries/missed school in her early elementary years. My wife and I have a standing debate about the word bury. She pronounces it bary and I pronounce it bury. We appreciate your response! Harrison: Thanks for writing — and for listening. Is your wife perhaps a midwesterner or westerner, and you perhaps originally from somewhere east? Although it's not hard-and-fast, your speech background — east vs. west — could go a long way toward explaining your difference in pronunciation in this case. Have you ever heard of the "marry, merry, Mary" pronunciation test? In a very general way it identifies whether your speech background is eastern or midwestern/western. If you pronounce the vowels in these words distinctly — "marry" with the /a/ of "hat," "merry" with the /e/ of "met," and "Mary" with the /a/ to /r/ glide of "pair" — you have an eastern pronunciation, while if you pronounce those words indistinguishably — with all three rhyming with "hairy" and "fairy" — you have a midwestern/western pronunciation. Ask your wife how she pronounces the name "Barry." Does it sound just like the way she says "bury"? Then ask her how she pronounces "berry." Do the vowels in all three sound the same? Do you say these words differently? It's the same sort of test, but with /b/ instead of /m/. If this diagnostic aid works, then you are dealing with a regional difference based on ingrained speech habits, and you'll just have to live and let live because you're both right. But if it's something else, give me more details and I'll give you a second opinion. Thank you for your expertise, insight, and wit in writing and narrating Verbal Advantage. Recently, I had the pleasure of a vacation with my 86 year old mother. We had lots of windshield time between attractions, so I suggested we listen to VA while driving. She had never heard of it, and knew nothing about it. My mother (now retired) had a long career in library science. She earned a BA Degree from a major university in that specialty. She was one of the top reference and cataloging librarians in the State of Wisconsin during her many working years. She has an excellent vocabulary, and (as one can imagine) knows far more about spelling, pronunciation, grammar, and usage than most people. Also, despite her age, she is still quite sharp mentally. She absolutely loved it! In fact, she wouldn't let me play anything else on our car audio system for the duration of the trip. And, despite her education and life experience, she learned a great deal from it. She especially enjoyed your regularly interspersed clever vignettes regarding grammar, pronunciation, and usage. She doesn't know it yet, but I've just ordered your VA Book, and will surprise her with it as a gift. I'm certain she'll really enjoy it. She lives in a retirement community with other seniors, and her passion is her weekly game of high-level Scrabble with peers. I'm sure VA will help her play even better...which will make her really happy. Thanks again, and keep up your good work! Wow, Ken, you made my day. Thanks! For many years I've been a library advocate in San Diego, and I love librarians, so your mom's endorsement means a lot to me. If you click on "Write to Charlie" in the sidebar on the right and give me a mailing address, I'd like to add a lagniappe to your gift for her by sending the first two levels of the audiobook version of my companion volume to Verbal Advantage, WORD WORKOUT. That book, along with THE ACCIDENTS OF STYLE and WHAT IN THE WORD? may also interest your mom. And, because she's a librarian, she may also be interested in my vocabulary-building novels for highschoolers, TOOTH AND NAIL and TEST OF TIME. And, of course, for your mom's 87th birthday you'll have to get her a copy of my forthcoming book HOW TO TELL FATE FROM DESTINY. The prefix be- has several meanings. It may mean to deprive of, as in behead. It may mean all around, on all sides, as in beset and besiege. It may mean all over, as in besmear, besprinkle, and beslobber. And it may mean completely, thoroughly, as in besotted, completely drunk. Other words in which the prefix be- means completely, thoroughly, include becalm, to calm completely, and benumb, to numb thoroughly. We admitted we were powerless - that our lives had become unmanageable. My question is the dash between powerless and that. Why not a comma or a period to end the sentence and start a new one with That ? I have been told a dash signifies end of thought, start of new thought. Could you please clarify. I love your love of language. Which do you consider correct/preferred, and what is your 'go to' dictionary for answering this? This is the typical, natural, inevitable, and usually desirable process that we see with so many compound words in English: they start out open (as two words), then become hyphenated, then become closed. For example, horseshoe began as horse shoe, then became horse-shoe, and finally horseshoe. Modern examples of this process include Web site becoming website and E-mail becoming email (whose closure I hope I have helped along by insisting on it in my books since the 1990s). When considering whether a compound should be open, hyphenated, or closed you should consult what the dictionaries say but make your own decision based on how long the compound has been in the language and whether it is crying out for closure. Technological compounds, because they are so prevalent, will close much faster than compounds such as "backyard" and "lightbulb," which dictionaries, until quite recently, if you can believe it, listed as "back yard" and "light bulb." For a quick ruling on what's hyphenated in current English and what's not, I usually consult Merriam-Webster's Collegiate. But I have written books for Random House and for Houghton Mifflin Harcourt, which rely on their own house dictionaries (in the latter case the American Heritage), and I defer to house style unless I have a strenuous objection. I'll try to make the next one more challenging. Thank you for your response to the syrup question. To add on to that, if we were getting technical, wouldn't SYR be pronounced seer, much like pyramid or myriad? I'm not familiar with words that start with a letter, then YR, and are pronounced sir. Is it simply because the manufacturers call it sir-up? And if so, if someone was getting technical could they argue that it is incorrect? I understand that it can go either way, since they can call it whatever they want, but I'm hoping you can settle this long-standing funny debate. And no east-coast bias. Thanks! I wish you were on Facebook and regularly post your teachings there!!! I loved today's Mandy Connell radio show in Denver. Is there a word that describes a parent who has lost a child? For example, a woman who loses a spouse is a Widow. A child who loses both parents is an Orphan. My apologies for taking so long to answer this question; I've been feverishly finishing a book on deadline. It's an excellent question (though terribly sad), and pertinent to so many people's lives, mine included: my parents lost two of their four children, and in just the past two years my wife's sister lost a son and her parents lost a daughter, my wife's other sister. Because losing a child is not an expected event, like the death of one's parents or a spouse, English has unfortunately resisted embracing a word for "a parent who has lost a child." (English also doesn't have a word for a child who has lost one parent.) So we speak of a "bereaved parent" to indicate this loss, and recently we have begun referring to a parent who has lost a child in military conflict as "a Gold Star parent." But don't despair. Where there's a will there's a word. At this website (https://today.duke.edu/2009/05/holloway_oped.html) you will find the word "vilomah," adapted from a Sanskrit word meaning "against the natural order," proposed by a professor at Duke some years ago for this definition. And here (https://parenting.blogs.nytimes.com/2010/06/08/describing-grief/) you will find some heartfelt commentary about "vilomah" in an article from The New York Times. Thank you for your dedication!! In VA the definition of Sanction is " approve, allow or permit". However online, in the media and in many other places they also use it as penalties for disobeying the law. Can you elaborate on the proper diction for this word. Big fan of Verbal Advantage, but I wish there was an index to all the words within. It's hard to go back and find a particular word when I need to review it. Any chance you have this separately? Thank you for addressing my comment [see below], however, you (and Mandy) misunderstand. I am the caller regarding the"eon" suffix. One has "lunch." One goes to a "luncheon." However, one is not on the receiving end of a "trunch," but can be on the receiving end of a "truncheon." Every time I ask this question of fellow "word nerds," I try to present it using the admittedly archaic words, "truncheon," "bludgeon," "dudgeon," "puncheon," and "dungeon." I try, as hard as I am able, to elicit a response based upon those words alone. Granted, they are, as I've previously stated, somewhat archaic. Also, every time I present this to my fellow aforementioned word nerds, I find myself having to fall back onto the more commonly (that is to say, currently) acceptable word, "luncheon," and it is THAT word that everyone fixates upon. If you were to take "luncheon" off the table, so to speak, does your definition and/or explanation still hold true? I thoroughly enjoy it when you are a guest on the Mandy Connell show on KOA. I was listening today and noticed Mandy referred listeners to your website several times. She said "you can go to Charles-uz-iz website @ ...." Is that the correct pronunciation? It was driving me nuts! Also, if I am having a sign made for newlyweds whose last name is "Johnson", should the sign say "The Johnsons" or "The Johnson's"? Thank you! On the Mandy Connell show today (September 21, 2017) on 850 KOA Denver, I promised to look into two questions and address them here. First, a caller wanted to know if "-eon" was a legitimate suffix in words like "luncheon," "dungeon," "dudgeon," and "truncheon," and, if so, what it meant. Could it be a diminutive suffix, indicating something smaller, like "-ette"? Sorry, but no. The peculiar spelling "-eon" in these words is not a suffix and is just one of many variant spellings from Middle English that we haphazardly settled on. Also, as I mentioned on the air, a luncheon is more formal than a lunch and is always associated with some special event. I'm wondering whether I have to use "a" or "an" before a term like "Nash Equilibrium". Charles, sorry, that last was too long. I just realized that. But that was another person's response to my passing on your info on "stumbled". So now I'm confused as to who is right. One thing I know: "I stumbled my brother" just sounds wrong. Also, according to Webster, the British Dictionary definition of stumble does not allow for a transitive use. Pity. Therefore, in America it's okay to say, "...if a stone can stumble me, so can a brother." Using stumble transitively may sound odd to some, but I'm not going to let stumble stumble me. "This has become my belief since I am a kid." Shouldn't it be "since I was a kid"? The verb to "stumble" is intransitive, meaning it does not act on an object, as opposed to a transitive verb, which needs an object to act on. In "She hit the ball," the verb to "hit" is transitive; it acts on the ball. But in "I can walk," the verb to "walk" is intransitive; it performs an action without having to perform it on something. Is there such a word as "convorted?" I can't find such a word in my dictionary, but at 0:12 below it sure sounds like the witty Jeanne Moos says, "Donald Trump may once have convorted with women of ill repute in Moscow . . . ." Did she make a verbal error or is she using the correct word "consorted" and I just misheard it? I am very happy with my experiences about your Verbal Advantage. That was the first one of my favorite books and the first that really made me optimistic in this way. It is impossible to tell you much this kindness on your part is appreciated for me. I would like to know your opinion about easy steps for grammar in English language. If I were a speech pathologist, I could give you a better answer. But I'm just a humble orthoepist (someone who opines on correct pronunciation), so I'll have to give you an educated guess. I'm not sure it's a question of knowing how, as you say, but rather a question of not being able to, or of not hearing the difference. It may be a kind of speech impediment related to a lisp, where, in this case, the palatal /sh/ gets substituted for the sibilant /s/ (mostly, as you noted, in words that begin with str-, including street). Missing teeth could contribute to this. Or it may be similar to the nucular for nuclear problem, where people just can't hear themselves saying it wrong. Or it may be both. But let's be clear on one thing: It's not that they can't pronounce the /t/; they say SHTRONG, SHTRING, SHTRANGE, and SHTREET. It's that they can't pronounce the /s/ as a pure sibilant before a /t/ and instead utter it with an intrusive /h/. On August 11, 2017, I was a guest on Ross Kaminsky's show on 630 KHOW in Denver, and I fielded two tricky questions that I promised I would post answers to here. The first question was whether the proper form for a person from Colorado is Coloradan or Coloradoan. In his excellent book on "demonyms" (names commonly given to residents of a place), Paul Dickson favors Coloradan and writes that "the variant Coloradoan shows up in print with some regularity, but it is unpopular with natives of the state. When one considers that the usual practice is to drop the -o when creating a demonym from a Spanish name (Colorado is Spanish for "colored"), the case for Coloradan becomes stronger." And Garner's Modern English Usage has this to say: "These two names vie closely for predominance. Coloradan has had the slight edge since the 1860s, but there have been periodic reversals in frequency of use in print sources. Coloradan is the safest editorial choice for now, even though Coloradoan has recently shown signs of resurgence." I am a non-native speaker of the english language. i have found your vocabulary books very useful. I am having a bit difficulty spelling words. Weak vowels are the problem. I pronounce the words correctly but i cannot differentiate between weak vowel sounds. For example, i sometimes ,often mistakenly, confuse an "uh" sound and cannot tell whether the sound is "o" or "a" in spelling. How to overcome this problem as it is causing a lot of spelling mistakes? Alas, this is one of the hardest questions to answer about English because English is so dadblamed inconsistent and unpredictable in its spelling and pronunciation. What is a nonnative (no hyphen required) speaker supposed to make of "Wednesday" or "colonel," not to mention the multitude of words that employ what linguists call a "schwa" (SHWAH, another word that's difficult to pronounce), which is that "weak" sound you refer to for vowels, like the /a/ in "ago" and "final," the /e/ in "item" and "novel," the /i/ in "edible" and "imminent," the /o/ in "connect" and "gallop," and the /u/ in "lettuce" and "column." In Romance languages there are no "weak" vowels (I call them "unstressed," "obscure," or "variable"), but English is rife with them, and this, as you attest, causes much consternation for nonnative speakers. I always hate having to say this because I wish I could offer more helpful advice, but you're just going to have to listen and study carefully, and memorize the trickiest ones. Learning the diacritical marks in English dictionaries, particularly the schwa, which is represented by an upside-down, backwards /e/, will help you. Creating lists of words with similar obscure vowels may also help. And remember: Even the pronunciation of native English speakers can vary with these unstressed vowels. For example, the /a/ in "sofa" is always /uh/, but the /o/ in "carrot" and the /i/ in "privilege" can be an /ih/ or an /uh/. You can also use a spellchecker, but be careful and double-check because they are notoriously unreliable. Learning words is fun but those mysterious pronunciation symbols in dictionaries are killjoys. Why the heck don't modern dictionaries just use simple to understand phonetics and make everyone's life easier? P.S. The Verbal Advantage cassettes and booklets are the bomb! Thank you, Charles Harrington Elster! What is your position on the pronunciation of "robot"? I've seen both ROH-bot and ROH-but listed in dictionaries, but whenever I use the pronunciation ROH-but I'm met with confused stares. Thank you, as always, for your incomparable insight. is there a word for the phrase or word that a person keeps saying after every sentence. For example, do it, '''nicely. put the plates down,'' nicely. in this case nicely is being repeated at the end of the each sentence. what would it be called , a pet word or something else? I am a columnist for eight metro-Denver weekly newspapers, and recently wrote a column that stated the word "whom" no longer shall exist. Therefore "Who do you love?" will not only be acceptable - it will be correct. A man who just moved here from Australia had a lot to say about American English, and said that he has been chastised for using "acclimatised" and "acclimatized." (Spell Check doesn't seem to like "acclimatise.") I told him you would know if it was acceptable here in the states. Thoughts? Thanks. I searched and searched, but I could not find a legitimate definition of the term "referenceable". Is it even a word? In my workplace, I hear lots of people refer to "customers that can be referenced" as "referenceable". It sounds needlessly long. If not a real word, is "referable" the term we ought to use instead? Regarding pronunciation of "often." Could the sounded /t/ be regional? I am originally midwestern but living in northern New England I find everyone-ish pronounces the /t/. Sean again. Years and years ago, I could have sworn you mentioned a word that described train enthusiasts. I had a boss who loved to photograph trains so much that he would get familiar with train schedules so he could be in the right place in the right time...around the DENVER area, if you can imagine that. I figured he would know the term, but all he came up with was "train-spotter." This is NOT the term I heard, but I can no longer recall what that term was. Searching online turns up ferroequinologist...could that be it? There is little online to support this term. I may have mentioned ferroequinologist way back when because it's in my book There's a Word for It on page 121. But, as with many of the entries in that book, which I wrote in the mid-1990s, I have no dadblamed idea where I found it. I just checked the OED, Webster 2, Random House 2, and all my go-to sources on unusual words and came up dry. However, my colleague Erin McKean, who runs the wordie-website Wordnik.com (for which I was once pronunciation editor), offers this page that may be helpful to you: https://www.wordnik.com/words/ferroequinologist. Scroll down to the one comment, which mentions Dow's Dictionary of Railway Quotations. I heard you on the Mandy Connell show Thursday. I was zipping around the east side of Denver on E-470 headed for Colorado Springs. The trip was smooth and the educational radio enlightening. My question to you sir, where in the world did the illness of stripping the t from not when asking a question come from? Example: Are we going out to eat or no? Hold your proverbial horses, friend. I know we all have pet peeves, which is fine, and I feel your pain that this one really bugs you. But you may want to reserve your linguistic ire for something certifiably egregious, especially when it comes to putting a longstanding relationship on the line. Why? Because the fact that you can't produce any evidence for your objection and have to consult me for a ruling is a tipoff that the objection may be a crotchet without any authoritative corroboration. Merriam-Webster's Dictionary of English Usage (1994) explains that "a few commentators around the end of the 19th century . . . objected to 'no' qualifying a verb and meaning 'not' — a matter chiefly of objecting to the phrase whether or no." But in 1906, one of my favorite early 20th-century commentators, Frank Vizetelly (who wrote extensively on pronunciation and usage and was editor in chief of Funk & Wagnalls dictionaries), declared that this expression "had literary sanction." And M-W confirms that, noting that they "have usually found or no (with or without whether) used in place of or not in literary contexts or by literary figures," and they offer citations for it from such luminaries as W. H. Auden, Alexander Woollcott, and E. B. White. Do you think pronouncing the "o" in "Iowa" as -uh- instead of -oh- is sloppy? Not to put too fine a point on it, but it's not The Beastly Book (although at times writing it I thought it might be). It's The Big Book of Beastly Mispronunciations. Now that we've got that out of the way, on to your question. There is a word I hear people pronounce that makes it sound like the definition is something bad. It is "epitome." The emphasis is on the 'pit', rather than on the epi. It's made up of two words 'epi' & 'tome,' like another word of such makeup: 'epicenter.' You wouldn't say 'eh-pis-ehnter, now would you, emphasizing the 'pis.' Since epitome is the same makeup as epicenter, it should be pronounced ehpee-tohme, or ehpee-tohmee, reflecting what words are combined to make it. It just bugs be to no end when I hear it pronounced with the emphasis on 'pit', just as another word I hear pronounced badly: 'Tsunami,' without the 't' sound. There is also a name I always pronounced a certain way, but the accepted pronunciation is different: 'Piers.' I pronounce it 'pie-ers,' rather than 'peer-s.' I've tried to find if my pronunciation is applicable, but nada. Can it be pronounced that way? You're right about "tsunami": It should have a bit of an audible /t/ before the /s/. But I'm sorry, you're off track on "epitome." The traditional and only proper pronunciation is i-PIT-uh-mee. The word comes from the Greek "epi-," upon, and "temnein," to cut (the source of the combining form "-tomy," as in "anatomy," "lobotomy," "colostomy," etc. ), and it was originally (and still is) a synonym of "abridgment." During my appearance today (March 16, 2017) on the Mandy Connell Show on KOA Denver, a caller asked me about the difference between "garnish" and "garnishee." When referring to placing a lien on someone's wages or property, the caller thought it should be "garnishee," not "garnish," which usually means "to adorn or decorate." Because we had to go to a commercial break I never got to answer the question, so I promised to respond here. First, there is considerable difference of opinion about this. The New York Times Manual of Style and Usage says that both words "are properly used as verbs in the sense of putting a lien on property or wages to satisfy a debt. But garnishee is more common (despite objections by lawyers), perhaps because the more usual meaning of garnish is to adorn or decorate." The stylebook of The Associated Press takes that a step further and says, "Garnish means to adorn or decorate. As a verb, garnishee . . . means to attach a debtor's property or wages to satisfy a debt. As a noun, it identifies the individual whose property was attached." But wait a minute. Bryan A. Garner, a legal lexicographer — he is editor in chief of Black's Law Dictionary and the author of Garner's Modern English Usage, for which I was a consultant — disagrees. "In American English," he writes in GMEU, "the usual verb form is garnish (= to take property, usually a portion of someone's wages, by legal authority). Garnishee is usually reserved for the noun sense "a person or institution, such as a bank, that is indebted to another whose property has been subjected to garnishment, especially to satisfy the debt." Garner notes that, contrary to what The New York Times manual claims, in current usage "garnished his wages" is five times more common than "garnisheed his wages." (My unofficial survey of both Google Search and Google News confirms this, with the latter showing over a million hits for "garnish wages" versus barely a hundred for "garnishee wages.") The verb to garnishee and the corresponding noun garnisheement, Garner concludes, "are historically unwarranted forms and therefore ill-advised." I haven't seen or heard anything about you for a long time. I thought that maybe you moved out of SD. Have you considered giving a presentation to the likes of OASIS, like your former cohort Lederer does? You're at least as entertaining as the bombastic Lederer, and much easier on the eyes. My reason for bothering you today is this: I hope that you can help me find just the right word for what I am trying to describe. What would you call a person or WHEN a person deliberately leaves clues to a secret life that he wants the people that he has kept secrets from to find? He cannot be direct, coming clean about his deceit. Instead, hopes that the clues will broach the subject, allowing (forcing?) him to either explain or deny the clue or discovery of said clue. For instance: an adulterous husband deliberately leaving out a book, which was inscribed by a lover, for his unsuspecting wife to discover. Or, the same man, who has told his lover that he is divorced from his wife and now living only with his teenaged child, but has on his refrigerator one, solitary magnet, an obviously child-made one with the sentiment "To Mom" on it, which he intends for his lover to see because he takes her to his kitchen and to the 'frige, opening the door to show the contents of the 'frige - a ruse to get her to notice the magnet. I hope this makes sense. Nice to hear from you, Mimi. Regarding your word question: Sorry to say, I have no idea; you got me there. I don't know of any word that might even approximate the complexity of that definition. And my attempts to coin one came to naught: I think to do so you'd need to string so many combining forms together the result would rival German in its bloated grandiloquence. So again, my apologies. I hope you are in a good health. I know the meaning of the mentioned words individually, but reminding all of them simultaneously seemed to be arduous for me. Am I fastidious about this? I was wondering if you give your advice. I would like to commend you for the excellence you have demonstrated as a teacher in my lovely book verbal advantage. Actually, thanks a galaxy for helping us navigate the stormy sea of English words. In deed, as a non-native learner who read the Magoosh and Manhattan GRE book, when i am reading your book i don't feel that i am studying because it is so clear and your eloquence mesmerize us, doesn't get us tired. Can you please tell me if it's correct to use "pairs" for plural? I was taught the plural of "pair" is "pair." It also drives me a bit nuts that the media started using "troops" to describe one person in the military. For example, "One troop was killed in Iraq." Is it also correct to use "terror" in this sentence: "It was an act of terror." I think it should be, "It was an act of terrorism." Regarding "pair," you were taught incorrectly. "Pair" used as a plural ("three pair of socks") is nonstandard. Although you will often see and hear this usage, in careful speech and writing "pairs" is the preferred plural. Regarding "troop(s)": It is standard to use "troops" to mean "soldiers," and it is acceptable to use "troops" to mean "individual soldiers" ("six troops were wounded"), but only when that reference is plural. To use the singular "troop" to mean "a soldier" is nonstandard, so that grating in your ears is justified. Regarding "terror," the usage you cite is less common but not incorrect. The Oxford English Dictionary documents its use since 1800. (See quotation below.) The OED also lists related established phrases such as "terror alert," "terror attack," "terror threat," "terror group," "terror plot," and "terror campaign." b. As a mass noun. The use of organized repression or extreme intimidation; terrorism. 1864 Bangor (Maine) Daily Whig & Courier 21 Jan. 1/5 (heading) State Terror in the South. 1937 A. Koestler Spanish Test. vi. 132 They had neither the inclination nor the need to..safeguard the territory behind the lines by the application of methods of Terror. 1977 P. Johnson Enemies of Society xviii. 241 Thanks to their use of terror, they [sc. the Assassins] often..forced governments into compliance or impotence. 2004 N.Y. Times Mag. 2 May 51/1 All the major countries on the front line of the war on terror are currently detaining such suspects, often for indefinite periods of time. Charles, I've been wondering why you dislike the word "unique?" Doesn't "sui generis" mean the same thing? Also, I recently watched a bit done by George Carlin in which he says that a "near-miss" is actually a NEAR HIT! If you think about it, it's true. Have we all been misusing "near-miss" this whole time? I've also been wondering about the use of "fewer" and "less." I know fewer refers to count nouns--number rather than amount, but am I right that it's LESS THAN x% (say 15%, for example) because LESS modifies a percentage rather than a numerical quantity? Thank you. P.S. To correct my own punctuation: I should've left the "?" off the end of the first sentence. I know, I know, it wasn't a question! I'll address the punctuation matter first: Yes, that first sentence wasn't a question and didn't need a question mark; it needed a period inside the close quotation mark. However, if it had been a question, the question mark would have to go outside the close quotation mark because it pertains to the whole sentence, not just to the material quoted. Now on to the usage questions. I boycott "unique" because it is almost universally misused and I don't want to abet that. One example of the misuse, from the American Heritage Dictionary, should suffice: "Omaha's most unique restaurant is now even more unique." No one would say "That was somewhat sui generis" or say that something was more sui generis than something else because, I'm confident in assuming, the people who use "sui generis" know that, like "unique," it's an absolute and shouldn't be modified. So that's why I eschew (es-CHOO) "unique" and, when appropriate, use "sui generis" instead. I love George Carlin and adore his riffs on words. The near-miss routine is one of his classics, and of course he's right: the locution seems to imply a failed intention to collide. But you don't mention his turn on "unique" and some of the other bugbears we language mavens love to kvetch about. If you haven't checked those out, I exhort you to do so. For "fewer" and "less," I also exhort you to read the discussion in my book The Accidents of Style. You are right that "less" is the better choice for percentages because they don't refer to a number of things tallied but rather to an amount taken as a chunk of the whole: "Less than 35 percent of voters support the measure." For more info, see pages 40-43 in the book.